Use this heavy duty 6-foot VGA cable to connect a standard desktop or laptop PC's VGA port to the monitor or projector with VGA Input connector. 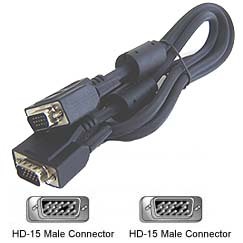 You may also use this type cable for connecting between the desktop or laptop PC with VGA video switches, VGA video distributors, or converter boxes. Heavy duty cable with fully molded D-sub 15-pin male to male connectors.